A fistula is an abnormal pathway between two anatomic spaces or a pathway that leads from an internal cavity or organ to the surface of the body. A sinus tract is an abnormal channel that originates or ends in one opening. An orofacial fistula is a pathologic communication between the cutaneous surface of the face and the oral cavity. In the literature, the terms fistulas and sinuses are often used interchangeably. Stedman's Medical Dictionary defines a sinus as a fistula or tract leading to a suppurating cavity. Orofacial fistulas are not common, but intraoral sinus tracts due to dental infections are common. When infection or neoplasia is involved, immediate treatment is necessary. Dental infections, salivary gland lesions, neoplasms, and developmental lesions cause oral cutaneous fistulas, fistulas of the neck, and intraoral fistulas. Chronic dental periapical infections or dentoalveolar abscesses cause the most common intraoral and extraoral fistulas. These dental periapical infections can lead to chronic osteomyelitis, cellulitis, and facial abscesses. Infection can spread to the skin if it is the path of least resistance. Fascial-plane infections, space infections, and osteomyelitis can cause cutaneous fistulas. Fascial-plane infections often begin as cellulitis and progress to fluctuant abscess formation. Compared with the other conditions, fluctuant abscess formation is more likely to result in cutaneous fistulas. A cutaneous lesion such as a furuncle can be misdiagnosed as a sinus tract to the skin of the face. 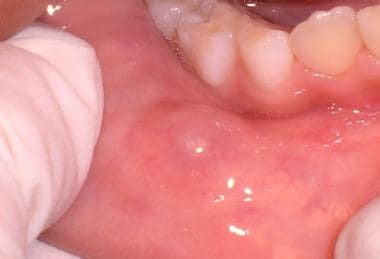 One case report  demonstrates this occurrence from a periapical infection from the right central mandibular incisor, which drained to the patient's chin. Because the tooth could not be restored, it was extracted, which resolved the lesion. Another case with cutaneous manifestations involved a 44-year-old woman with a draining lesion to the skin just lateral to the nasofacial sulcus. Oral antibiotics did not help resolve the lesion. The patient had poor dentition, and a panoramic radiograph showed 2 periapical radiolucencies of the maxillary right lateral incisor and canine. The teeth were extracted, which resolved the lesion. Sheehan et al  recommend a dental examination and radiographs to rule out infection of dental origin to the cutaneous face or neck. For general information on dental infections, see Dental Infections in Emergency Medicine. Origins and spread, salivary gland fistulas, oral antral and oral nasal fistulas, iatrogenic fistulas (eg, dental implant placement), and miscellaneous orocutaneous fistulas are addressed here. Dentoalveolar abscesses originate from direct extension or continuity from an acute irreversible pulpitis that spreads beyond the apex of the tooth. Another cause of dentoalveolar abscesses is an acute exacerbation of a chronic apical periodontitis or periapical granuloma. Periapical granulomas may remain quiescent because the inflammatory cells are walled off by connective tissue. A periapical granuloma may exacerbate to an acute infection if the patient's resistance to the organism decreases or if the number of microorganisms increases. This condition is also termed a phoenix abscess. Unusual dental malformations may lead to periapical dental infections. Dens in dente or dens evaginatus, an axial invagination of enamel and dentin into the dental papilla, frequently develops periapical infections, which can lead to sinus tract formation. [3, 4, 5] Even more rarely, taurodontism  consisting of elongated crowns or apically placed furcations with pulp chambers with increased occlusal-apical height can cause periapical disease, leading to a sinus tract or parulis. Most of these dental infections remain intraoral, and they most often spread to the facial or buccal side of the alveolar ridge. If the dental roots are closer to the lingual side, as they often are with the maxillary anterior teeth and the lingual roots of the maxillary molars, a palatal sinus tract may develop. When a sinus tract appears as an intraoral papule or pustule, it is called a parulis. When a chronic infection is acutely exacerbated or persistent, the infection can spread to the facial skin, most commonly in the area of the chin. Numerous barriers, including bone, muscle, and facial planes, determine the path of infection spread. Yasui et al  reported a cutaneous fistula of dental origin. A 75-year-old Japanese woman presented with the chief complaint of a left-cheek skin lesion with mild pain. A subcutaneous nodule with erythematous skin was on her left cheek. Dental examination demonstrated a radiolucent area in the left-lower first molar periapical region. The tooth was asymptomatic. Antibiotic therapy and endodontic therapy eliminated the subcutaneous nodule. The authors recommend a complete dental evaluation be performed when a subcutaneous facial nodule is encountered. If the infection originates from a region of the maxillary molar, intraoral spread of the infection occurs buccally. When the infection spreads inferior to the superior attachment of the buccinator muscle, it remains in the oral cavity. If the infection path moves superior to this attachment, cutaneous spread with fistula formation is possible. Infection from the maxillary molar teeth can spread to the palate and into the maxillary sinus, depending on the position of the lingual roots of the teeth. Maxillary dental infections also may spread to the canine fossa, buccinator space, lateral pterygoid space, and infratemporal space. Spread of infection to the lateral pterygoid and infratemporal spaces is associated with trismus. Infection of maxillary premolars almost always stays confined to the oral cavity and most commonly spreads to the buccal side of the alveolar ridge. Infection from the maxillary anterior teeth is usually contained within the oral cavity. Spread of infection superior to the levator anguli oris muscle or orbicularis oris muscle may result in cutaneous spread. Infection from the mandibular molars is usually confined to the lingual aspect of the oral cavity by the mylohyoid muscle and to the buccal aspect by the inferior attachment of the buccinator muscle. If the infection penetrates to the lingual area inferior to the mylohyoid muscle, infections of the submandibular, sublingual, and submental spaces may result. If the infection spreads inferior to the buccinator muscle attachment, cutaneous spread may occur with fistulation. Infection of the mandibular premolars is almost always confined by the buccinator muscle in the oral cavity and most commonly spreads to the buccal side. Infection of the mandibular anterior teeth is usually confined to the oral cavity and spreads facially. If the infection spreads below the mentalis muscle, cutaneous spread may occur. Mandibular space infections may involve the submandibular, submental, pterygomandibular, masseteric, lateral and posterior pharyngeal, parotid, and carotid spaces. Chronic osteomyelitis more frequently drains through an extraoral sinus opening than through an intraoral opening. Osteomyelitis is more likely to develop in patients with uncontrolled diabetes, in those who have undergone jaw irradiation because of a previous malignancy (osteoradionecrosis), and in those with metabolic bone diseases such as Paget disease (osteitis deformans) or Albers-Schönberg disease (osteopetrosis). Garré osteomyelitis is a unique chronic osteomyelitis with a prominent periosteal inflammatory reaction that follows periapical disease or tooth extraction. It is uncommon, with average age of 13 years. Elimination of pulpal periapical infection through endodontic therapy without endodontic surgery was shown to be an effective treatment. In this case report,  total bone healing was observed 1 year later. Lymphatic spread is also common. Lymphadenopathy with movable tender nodes is a common finding with dental infections. Inflammatory lymph nodes caused by dental infection rarely result in cutaneous fistulas. Salivary gland fistulas are rare except with minor salivary gland mucocele. Saliva from damaged salivary glands or ducts finds the path of least resistance but rarely escapes through the skin or mucosa. The parotid duct or Stensen duct comes close to the cutaneous surface as the duct crosses the outer surface of the masseter muscle. A rare submandibular fistula was reported in association with a ranula of the submandibular gland. A case was reported with a cutaneous opening caused by an ectopic salivary gland. This instance mimicked a branchial cleft or branchial cyst fistula. Gerhard et al  state that ectopic salivary gland fistulas should be in the differential diagnosis of branchial fistulas. One interesting case is of a 4-year-old boy with an anterior cervical fistula, which secreted salivalike fluid while he was eating. Head and neck examination revealed an opening posterior to the hyoid bone. The fistula ascended superficially to the anterior cervical muscles, with a cyst anterior to the hyoid bone, continuing to the left submandibular gland. According to Hayasaka et al,  no previous reports have described the Wharton duct running from the submandibular gland to the anterior cervical skin. Trauma, microorganisms, neoplasms, xerostomia, immunosuppression, and malnutrition usually are the cause of infections that result in fistulas from salivary glands. Iatrogenic causes include surgery and radiation therapy. Patients who are ill or debilitated may be prone to these infections. Actinomycosis, syphilis, tuberculosis, salivary calculi, and malignancy are other etiologic agents that cause salivary gland infections. Staphylococcus aureus, Streptococcus viridans, and Escherichia coli most commonly are found in these infections. Sjögren syndrome, which has a female-to-male ratio of 10:1, is an immunologic disease that causes xerostomia. Patients with this disease have dry eyes, a dry mouth, and, in the secondary form, immunologic connective-tissue disorders, most commonly rheumatoid arthritis. Patients with Sjögren syndrome may be more prone to parotid gland infection, but this infection rarely results in sinus tract formation to the skin or oral mucosa. Salivary gland stones or sialoliths can be a site of infection. These are most commonly associated with the Wharton duct, the major duct for the submandibular gland. Any gland can be affected. The sialolith blocks the ductal secretion of saliva, causing a fluid buildup that creates a potential site for infection. A ranula or mucous retention phenomenon of the floor of the mouth results from this blockage; when this is large, it is treated by marsupialization. This technique exteriorizes a cyst or other such enclosed cavity by resecting its anterior wall and suturing the cut edges of the remaining wall to adjacent edges of the skin, thereby creating a pouch. Drage et al  presented 3 cases of a migrating salivary stone or sialolith to adjacent tissues, resulting in cutaneous fistulas from salivary gland origin. Two patients were treated successfully surgically, which resulted in resolution of the fistulas. A mucocele or mucous retention phenomenon occurs when minor salivary gland ducts are damaged. The walling off of mucin with granulation tissue causes a cystlike structure; on the floor of the mouth, this structure is called a ranula. This lesion is usually painless, and the patient often reports that it swells and breaks with a fluid discharge. More than 50% of patients with a mucocele or mucous retention phenomenon are younger than 21 years, and it occurs equally in males and females. Patients may remember biting their lip. Clinically, the mucocele appears as a clear or bluish fluctuant vesicle. It is most common on the lower lip and can be found in minor salivary glands of the palate and retromolar pad area. It is extremely rare on the upper lip. Physical trauma to the lower lip is the most common cause of mucoceles. Most upper lip swellings are due to cysts, odontogenic infections, and salivary gland tumors. The differential diagnoses include salivary gland neoplasms, especially mucoepidermoid carcinoma, vascular malformation, hemangiomas, and fibrous nodules or fibroma. Mucocele or mucous retention phenomenon lower lip. Tooth extraction, tuberculosis, syphilis, leprosy, malignant neoplasms, phycomycoses, midline granuloma (a form of lymphoma), and developmental clefts may cause oral antral and oral nasal fistulas. The most common cause of oral antral fistulas is tooth extraction. Maxillary first molars account for 50% of oral antral fistulas caused by extractions. Maxillary second and third molar extractions account for the other 50%. Prior to extraction, infection of these teeth may create a communication with the antrum. Approximately 10% of all sinusitis cases have a dental origin. Lopatin et al  concluded that an endoscopic approach to chronic maxillary sinusitis of dental origin is a dependable technique associated with less morbidity and a lower rate of complications. When patients ingest food and liquids, these may enter the nasal cavity and antrum, causing an unpleasant salty taste and fetid breath. Infection may cause sinusitis, which results in throbbing headaches that are aggravated by head movement. Nocturnal cough and epistaxis may result from drainage of exudate to the oropharynx and nose. Swelling and redness over the sinus and pain beneath the eye, especially with palpation, may occur. In all cases of idiopathic sinusitis, causes such as infection, polyps, and neoplasms should be excluded. Neoplasms, such as squamous cell carcinoma, may manifest as sinusitis until the neoplasm enlarges enough to show signs of malignancy. By this stage, metastasis may have occurred. An additional cause for oral cutaneous fistulas is MRONJ, formally known as BRONJ. The change in nomenclature is due to the growing number of antiresorptive (eg, denosumab) and antiangiogenic therapies other than bisphosphonates. Fortunately, only a small percentage of patients develop MRONJ. Bisphosphonates and other antiresorptive medications that are intravenously administered are used to treat patients with osteoporosis, patients with cancer who have hypercalcemia associated with malignant disease, and patients with multiple myeloma or metastatic tumors (breast, lung, prostate) in the bones. The treatment objectives for patients with an established diagnosis of MRONJ are to eliminate pain, control infection of the soft and hard tissue, and minimize the progression or occurrence of bone necrosis. Patients should have regular check-ups before, during, and after bisphosphonate therapy. Management includes antibiotics, pain control, and chlorhexidine mouth rinses over long periods of time. MRONJ treatment can be surgical or nonsurgical. Nonsurgical management includes antibiotics, systemic or topical antifungals, antimicrobial rinses, ceasing bisphosphonate therapy, and stopping dental therapy. Surgical solutions for MRONJ are limited due to the patient’s decreased healing ability. Before treatment with an intravenous bisphosphonate, the patient should have a thorough oral examination, extract nonrestorable teeth, complete all invasive dental procedures, and obtain best possible periodontal health. Patients with full or partial dental prostheses should be examined for areas of mucosal trauma. Patients need to be educated as to the importance of dental hygiene and regular dental evaluations, and instructed to report any pain, swelling, or exposed bone. Patients who take oral bisphosphonates for less than 3 years and have no clinical risk factors, no alteration or delay in dental surgery is necessary. The risk of developing MRONJ with oral bisphosphonates is very small but increases when therapy exceeds 3 years. For patients who are taking oral bisphosphonates for less than 3 years with or without corticosteroids, the prescribing physician should consider discontinuing therapy for 3 months prior to oral surgery, if systemic conditions permit. The bisphosphonate should not be restarted until healing has occurred. An oral cutaneous fistula leads to esthetic problems due to the continual leakage of saliva from the oral cavity to the face. Malignancy, inflammation, and trauma are the most common causes. Traumatic fistulas may be due to injury or surgical repair in areas where mucosal and epidermal surface epithelia line the fistula wall. No inflammation is associated with this type of fistula unless an infection develops (see the image below). 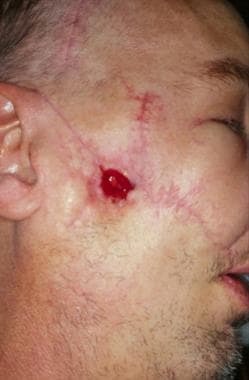 Gunshot wound causing an oral cutaneous fistula. Courtesy of Alexander Pazoki, DDS, LSU School of Dentistry, New Orleans, La. Dental implants can develop infections, leading to intraoral and possibly extraoral sinus tract drainage. One case report  described an implant failure causing a peri-implantitis. This was treated successfully without removal of the implant. In most cases, the implant must be removed when peri-implantitis occurs. This case involved an adjacent tooth with apical periodontitis that may have spread from the tooth or the peri-implantitis spread to the tooth, causing its demise. Treatment included a root canal, debriding the apical bone lesion, and using guided bone regeneration. Normal healing occurred and an esthetic result was achieved. Failed endodontic therapy or treatment after endodontic therapy can be a source of dental infection. Tanalp et al  reported a persistent sinus tract occurring after a post and core was placed on an anterior tooth. Two separate root perforations were causing the persistent infection. Granulation tissue was removed, the perforations were sealed with mineral trioxide aggregate, and bone graft was packed in the resorptive bone areas. Four months after treatment, the patient had no signs or symptoms. Ricucci et al  reported 2 cases in which calculus formation was reported as a cause of a persistent sinus tract after root canal therapy. In one case, a sinus tract developed that did not heal after conventional root canal therapy and apical surgery. Extraction of this tooth revealed calculuslike material on the root surface. The other case showed radiographic signs of healing after apicectomy. Histology of the apical biopsy specimen demonstrated a calculuslike material on the surface of the root apex. The presence of calculus on the root surfaces of these teeth may have contributed to endodontic treatment failure. Neoplastic fistulas result from the penetration of a neoplasm from the oral cavity to the outlying skin. The most common malignancy in the oral cavity is squamous cell carcinoma. Fistulas caused by squamous cell carcinoma have a poor prognosis because of skin lymphatic drainage (see the images below). Also see Cancers of the Oral Mucosa. Squamous cell carcinoma causing an oral cutaneous fistula. Courtesy of Alexander Pazoki, DDS, LSU School of Dentistry, New Orleans, La. Squamous cell carcinoma of the sinus that penetrates the maxillary ridge. Actinomycosis, although rare, is one of the most common infections that result in a fistula from the oral cavity to the skin. These infections respond to large doses of penicillin or beta-lactam/beta-lactamase inhibitors administered for a minimum of 6 weeks. Actinomycosis has been documented as a cause of continual, recurrent, periapical disease associated with endodontically treated teeth. One case presented by Jeansonne  demonstrated persistent periapical disease with recurrent sinus tracts. No pain or swelling was present after clinically acceptable initial endodontic treatment, but a periapical lesion developed. After routine endodontic retreatment, the periapical lesion persisted and a sinus tract developed. The sinus tract healed with antibiotic therapy but recurred within a few months. The sinus tract recurred and disappeared with antibiotic therapy over a period of 5 years. After histological diagnosis confirmed actinomycosis, the lesion was treated with antibiotics and periapical surgery. It finally resolved in 5 months. Fistulas may arise from developmental cysts of the neck region, such as thyroglossal duct, dermoid, sebaceous, preauricular, and branchial arch cysts. Nasopalatine duct cysts occasionally secrete fluid to the anterior palate and the site of the duct. Intracranial extension and a cutaneous sinus tract are rarely seen with craniofacial dermoid cysts. Scolozzi et al  reported a case of a 1-year-old girl who was initially seen with a cutaneous fistula of the frontotemporal region, from an intracranial dermoid cyst. The patient was treated surgically with a right lateral orbitotomy by a bicoronal approach. The cyst was seated within the lateral orbital wall, with intracranial extension through the temporal and sphenoidal bones to the dura of the temporal lobe. Histopathologic analysis confirmed the diagnosis of a dermoid cyst. Craniofacial dermoid cysts may rarely be associated with a cutaneous sinus tract and/or intracranial extension. Failure to identify and treat these lesions may lead to recurrent infection with a potential for meningitis or cerebral abscess. The authors strongly recommend CT scanning and MRI before surgical treatment of any cutaneous fistula in the head and neck region. The thyroglossal duct cyst is the most common of the developmental cysts of the neck. In embryonic development, the duct follows a path from the tongue to the normal position of the thyroid. These cysts have an equal incidence in females and males, and they usually are observed within the first 2 weeks of life. Proliferation of duct tissue may continue, causing enlargement of the thyroglossal tract. If a sinus opening to the neck occurs, the most frequent location is just below the hyoid bone. The epithelial lining may consist of squamous or pseudostratified columnar epithelium. Infection may occur anywhere along the duct tract, causing purulent exudate. Complete surgical removal of the thyroglossal duct epithelium is the treatment of choice; however, complete removal is difficult and recurrence is frequent. The lateral branchial arch cyst is the most common developmental cyst of the lateral neck. It occurs when the second branchial arch or second pharyngeal pouch is not eliminated in normal development. The endoderm of this pouch normally becomes the tonsil. A cutaneous sinus, a mucosal sinus, or both may occur. Lateral branchial arch cysts occur equally in males and females, and they may be familial. They can be unilateral or bilateral. They may occur in children; ruptured cysts may occur in adults. Usually, the opening is near the anterior border of the sternocleidomastoid muscle just above the sternoclavicular joint. The differential diagnosis includes a fistula or sinus from an infected or cancer-containing lymph node. Preauricular fistulas or sinuses occur in approximately 1% of the population. They are observed more commonly in blacks and Asians than in whites and occur equally in males and females. Approximately one fourth of preauricular fistulas are bilateral. They may be associated with other congenital anomalies such as Treacher-Collins syndrome. Preauricular fistulas originate from the abnormal development of the first and second branchial arches from the external ear. The most common site is the marginal helix of the ear at the junction with facial skin. Usually, preauricular fistulas are asymptomatic and require no treatment unless they become secondarily infected. They can be differentiated from first branchial arch anomalies because the first branchial arch usually opens into the external auditory canal and has a purulent discharge. Fistulas are an extremely rare variant of congenital facial malformations. Lymph nodes infected with mycobacteria cause scrofula, a condition in which infection spreads from the node to the skin through a sinus tract. Cat scratch disease is another consideration in the differential diagnosis of sinus tracts from lymph nodes. Preauricular fistulas or sinuses occur in approximately 1% of the population. Dental infections have no racial predilection. Preauricular fistulas or sinuses are observed more commonly in blacks and Asians than in whites. Dental infections occur equally in males and females. Preauricular fistulas or sinuses occur equally in males and females. Mucocele or mucous retention phenomenon occurs equally in males and females. Dental infections occur in persons of all age groups. More than 50% of patients with a mucocele or mucous retention phenomenon are younger than 21 years. 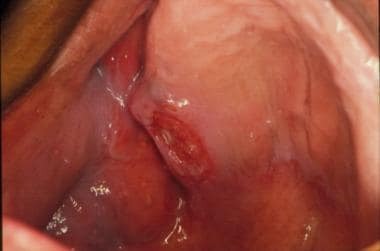 With mucoceles, removal of the fluid-filled sac and surrounding minor salivary glands results in an excellent prognosis for cure. Most dental infections are treated with incision and drainage and antibiotics, which result in an excellent prognosis. Usually, no morbidity and mortality occur. Cellulitis can lead to Ludwig angina and cavernous sinus thrombosis. The mortality rate of cavernous sinus thrombosis was 75% but now has decreased to 30% with newer antibiotics and steroid therapy. See Cavernous Sinus Thrombosis for more information. The mortality rate for Ludwig angina was 50% before the use of newer antibiotics. Now, the mortality rate is less than 10%. Deaths are due to complications such as aspiration pneumonia, spread to the mediastinum, sepsis, pleural cavity infection, and respiratory obstruction. Trismus is present with cavernous sinus thrombosis and Ludwig angina, and immediate intervention is imperative to prevent its spread to the mediastinum. Once the infection spreads, treatment is difficult, and death is more likely. For patient education resources, visit theOral Health Center. Additionally, see the patient education articles Dental Abscess and Toothache. Cantatore JL, Klein PA, Lieblich LM. Cutaneous dental sinus tract, a common misdiagnosis: a case report and review of the literature. Cutis. 2002 Nov. 70(5):264-7. [Medline]. Sheehan DJ, Potter BJ, Davis LS. Cutaneous draining sinus tract of odontogenic origin: unusual presentation of a challenging diagnosis. South Med J. 2005 Feb. 98(2):250-2. [Medline]. Gound TG, Maixner D. Nonsurgical management of a dilacerated maxillary lateral incisor with type III dens invaginatus: a case report. J Endod. 2004 Jun. 30(6):448-51. [Medline]. Nallapati S. Clinical management of a maxillary lateral incisor with vital pulp and type 3 dens invaginatus: a case report. J Endod. 2004 Oct. 30(10):726-31. [Medline]. Steffen H, Splieth C. Conventional treatment of dens invaginatus in maxillary lateral incisor with sinus tract: one year follow-up. J Endod. 2005 Feb. 31(2):130-3. [Medline]. Sert S, Bayrl G. Taurodontism in six molars: a case report. J Endod. 2004 Aug. 30(8):601-2. [Medline]. Yasui H, Yamaguchi M, Ichimiya M, Yoshikawa Y, Hamamoto Y, Muto M. A case of cutaneous odontogenic sinus. J Dermatol. 2005 Oct. 32(10):852-5. [Medline]. Sisodia N, Manjunath M. Chronic cutaneous draining sinus of dental origin. Ann Med Health Sci Res. 2014 Nov. 4 (6):962-4. [Medline]. Gonçalves M, Pinto Oliveira D, Oliveira Oya E, Gonçalves A. Garre's osteomyelitis associated with a fistula: a case report. J Clin Pediatr Dent. 2002. 26(3):311-3. [Medline]. Gerhards F, Büttner R, Jänicke S. [Aberrant salivary gland tissue in differential diagnosis of branchiogenic neck cyst]. HNO. 2001 Jun. 49(6):476-8. [Medline]. Hayasaka O, Miyajima H, Sato K, Seki S, Takahashi S. [Congenital anterior cervical fistula originating from the Wharton duct]. Nippon Jibiinkoka Gakkai Kaiho. 2005 Jun. 108(6):694-7. [Medline]. Ogawa K, Kondoh K, Kanaya K, Ochi A, Sakamoto T, Yamasoba T. Bilateral cervical fistulas from heterotopic salivary gland tissues. ORL J Otorhinolaryngol Relat Spec. 2014. 76 (6):336-41. [Medline]. Drage NA, Brown JE, Makdissi J, Townend J. Migrating salivary stones: report of three cases. Br J Oral Maxillofac Surg. 2005 Apr. 43(2):180-2. [Medline]. Lopatin AS, Sysolyatin SP, Sysolyatin PG, Melnikov MN. Chronic maxillary sinusitis of dental origin: is external surgical approach mandatory?. Laryngoscope. 2002 Jun. 112(6):1056-9. [Medline]. Rohart J, Nicot R, Myon L, Elbaz J, Raoul G, Ferri J. [Labial recurrent swelling revealing median congenital upper-lip fistula]. Rev Stomatol Chir Maxillofac Chir Orale. 2015 Jun 29. [Medline]. Ruggiero SL, Dodson TB, Fantasia J, Goodday R, Aghaloo T, Mehrotra B, et al. American Association of Oral and Maxillofacial Surgeons position paper on medication-related osteonecrosis of the jaw--2014 update. J Oral Maxillofac Surg. 2014 Oct. 72 (10):1938-56. [Medline]. Adornato MC, Morcos I, Rozanski J. The treatment of bisphosphonate-associated osteonecrosis of the jaws with bone resection and autologous platelet-derived growth factors. J Am Dent Assoc. 2007 Jul. 138(7):971-7. [Medline]. Marx RE, Sawatari Y, Fortin M, Broumand V. Bisphosphonate-induced exposed bone (osteonecrosis/osteopetrosis) of the jaws: risk factors, recognition, prevention, and treatment. J Oral Maxillofac Surg. 2005 Nov. 63(11):1567-75. [Medline]. Infante Cossio P, Cabezas Macian A, Perez Ceballos JL, et al. Bisphosphonate-related osteonecrosis of the jaw in patients with multiple myeloma. Med Oral Patol Oral Cir Bucal. 2008 Jan 1. 13(1):E52-7. [Medline]. Eklund MK. Bisphosphonate-related osteonecrosis of the jaws (BRONJ). Southwest Oral Surgery and Implant Blog. Available at http://blog.sworalandimplant.com/. Accessed: July 19, 2010. Wigler R, Steinbock N, Berg T. Oral cutaneous sinus tract, vertical root fracture, and bisphosphonate-related osteonecrosis: a case report. J Endod. 2013 Aug. 39 (8):1088-90. [Medline]. Tözüm TF, Sençimen M, Ortakoglu K, Ozdemir A, Aydin OC, Keles M. Diagnosis and treatment of a large periapical implant lesion associated with adjacent natural tooth: a case report. Oral Surg Oral Med Oral Pathol Oral Radiol Endod. 2006 Jun. 101(6):e132-8. [Medline]. Tanalp J, Dikbas I, Delilbasi C, Bayirli G, Calikkocaoglu S. Persistent sinus tract formation 1 year following cast post-and-core replacements: a case report. Quintessence Int. 2006 Jul-Aug. 37(7):545-50. [Medline]. Ricucci D, Martorano M, Bate AL, Pascon EA. Calculus-like deposit on the apical external root surface of teeth with post-treatment apical periodontitis: report of two cases. Int Endod J. 2005 Apr. 38(4):262-71. [Medline]. Jeansonne BG. Periapical actinomycosis: a review. Quintessence Int. 2005 Feb. 36(2):149-53. [Medline]. Dhuvad J, Patel B, Madan S, Dhuvad M. Orofacial tubercular lesions. Indian J Tuberc. 2014 Oct. 61 (4):325-30. [Medline]. Benson EM, Hirata RM, Thompson CB, Ha PK, Fakhry C, Saunders JR, et al. Pharyngocutaneous fistula after total laryngectomy: a single-institution experience, 2001-2012. Am J Otolaryngol. 2015 Jan-Feb. 36 (1):24-31. [Medline]. Chan CP, Chang SH, Huang CC, Wu SK, Huang SK. Cutaneous sinus tract caused by vertical root fracture. J Endod. 1997 Sep. 23(9):593-5. [Medline]. Tzerbos F, Bountaniotis F, Theologie-Lygidakis N, Fakitsas D, Fakitsas I. Complications of Zygomatic Implants: Our Clinical Experience with 4 Cases. Acta Stomatol Croat. 2016 Sep. 50 (3):251-257. [Medline]. [Full Text]. Lee EY, Kang JY, Kim KW, Choi KH, Yoon TY, Lee JY. Clinical Characteristics of Odontogenic Cutaneous Fistulas. Ann Dermatol. 2016 Aug. 28 (4):417-21. [Medline]. Alasseri NA, Assari AS. Facial fistula. Long-term sequelae of a complicated exodontia. Saudi Med J. 2015 Apr. 36 (4):490-3. [Medline]. Giménez-García R, Martinez-Vera F, Fuentes-Vera L. Cutaneous Sinus Tracts of Odontogenic Origin: Two Case Reports. J Am Board Fam Med. 2015 Nov-Dec. 28 (6):838-40. [Medline]. Chen K, Liang Y, Xiong H. Diagnosis and Treatment of Odontogenic Cutaneous Sinus Tracts in an 11-Year-Old Boy: A Case Report. Medicine (Baltimore). 2016 May. 95 (20):e3662. [Medline]. [Full Text]. Lee SJ, Jang KH, Spangberg LS, Kim E, Jung IY, Lee CY, et al. Three-dimensional visualization of a mandibular first molar with three distal roots using computer-aided rapid prototyping. Oral Surg Oral Med Oral Pathol Oral Radiol Endod. 2006 May. 101(5):668-74. [Medline]. White SC. Cone-beam imaging in dentistry. Health Phys. 2008 Nov. 95 (5):628-37. [Medline]. Ranga U, Aiyappan SK, Veeraiyan S. A Case of Intermittently Discharging Skin Lesion: Orodentocutaneous Fistula Demonstrated on CT Fistulography. J Clin Diagn Res. 2014 Aug. 8 (8):ZD09-11. [Medline]. Fattore L, Strauss RA. Hyperbaric oxygen in the treatment of osteoradionecrosis: a review of its use and efficacy. Oral Surg Oral Med Oral Pathol. 1987 Mar. 63(3):280-6. [Medline]. Andrews BT, Smith RB, Hoffman HT, Funk GF. Orocutaneous and pharyngocutaneous fistula closure using a vacuum-assisted closure system. Ann Otol Rhinol Laryngol. 2008 Apr. 117(4):298-302. [Medline]. Baron HC. Surgical correction of salivary fistula. GP. 1960 Jun. 21:89-98. [Medline]. Bronstein SL, Clark MS. Sublingual gland salivary fistula and sialocele. Oral Surg Oral Med Oral Pathol. 1984 Apr. 57(4):357-61. [Medline]. Ehrl PA. Oroantral communication. Epicritical study of 175 patients, with special concern to secondary operative closure. Int J Oral Surg. 1980 Oct. 9(5):351-8. [Medline]. Cutaneous fistula due to a dental infection that causes Ludwig angina. Courtesy of Alexander Pazoki, DDS, LSU School of Dentistry, New Orleans, La. Clinical view of a parulis with a sinus tract from a fractured mandible. Oral cutaneous fistula from a dental infection.